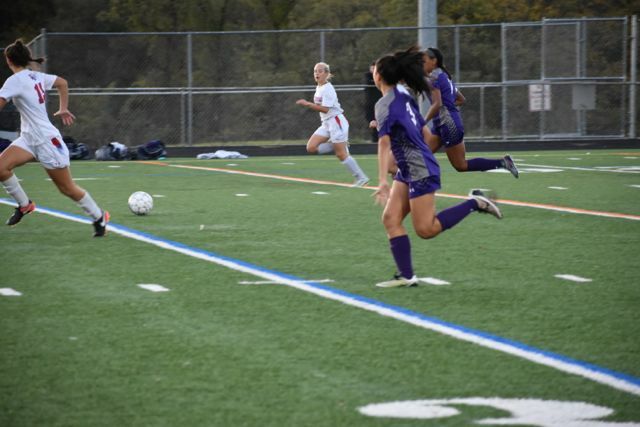 On Wednesday October 26, Centennial’s Girls’ Varsity Soccer team took an unexpected win over Long Reach High School. For a majority of the game, possession went back and forth. Though Centennial played well, 2 goals were conceded in the first half. For most of the second half, both teams played their defense to make sure the score stayed, but in the last 7 minutes, Centennial broke down Long Reach’s back line. After playing most of the game at defense, senior Kelli Dunnagan, was moved up top, quickly scoring Centennials first goal. Shortly after, Dunnagan scored another, putting Centennial back in the game. With their confidence restored, Centennial pushed forward to get a last minute goal from junior Ashley Moltz. With the excitement of Centennial winning their first round playoff game, the students in the crowd rushed the field, applauding the players in a frenzy. Centennial will play against the Atholton Raiders, on October 31 at Atholton High School.